Pumpkins are all the rage in fall. 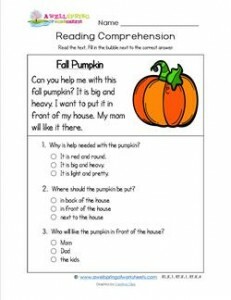 In this reading passage a child wants to move a pumpkin, but it’s too heavy. Where does he want to move the pumpkin and why? What size and shape pumpkins do your kids like best? Big ones like the one in this story, little ones they can carry easily, or pumpkins that are a medium-sized just right for them size? Be sure and check out all three worksheets in this download. One is in color, another in black and white, and the third one is an answer sheet.